My first breath underwater might as well have been my first breath. In June 2015, wide-eyed and wobbly, I knelt on the sand carpet of Florida’s Lake Denton as small, friendly bluegill fish bumped into my mask and wetsuit. Careful not to hold my breath (a cardinal rule of diving), I looked around this new world I was reborn into and imagined swimming alongside green sea turtles, massive manta rays and speckled whale sharks – animals I’d only seen in aquariums. The possibility of meeting these creatures face-to-face and exploring underwater caves, bright coral reefs and thick kelp forests was, and still is, one of my most exciting prospects. 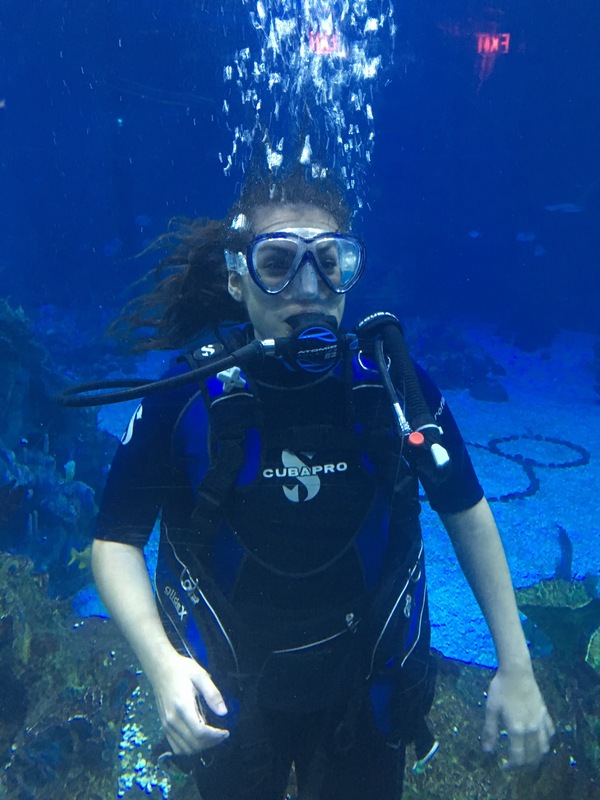 Since that first dive, I’ve completed two more levels of certifications and dove in some of the most interesting spots in Florida, like sinkholes, an aquarium in Disney’s EPCOT theme park and surrounded by hammerhead sharks off the coast of Jupiter. What drew me to scuba diving was my overwhelming sense of curiosity. I’m the kind of person who is constantly looking for something new to try or somewhere new to go. My dad has been scuba certified for about 40 years, and that, mixed with my ingrained love and appreciation of Florida’s waters, inspired my yearning to experience life beneath the surface. Diving is something I would encourage every person to try, because it is an activity that has many interesting benefits to scuba diving. One is that you get to develop your communication skills. When you’re underwater, you can’t talk to anyone. It’s like one big game of charades. You have to rely on a mix of hand signals, pointing and acting out to convey what you’re trying to tell your fellow divers. There are a few basic universal hand signals, like a thumbs up for indicating that you’re surfacing or crossing your arms to let others know you’re cold, but when your buddy doesn’t know the signals or wants to convey something else, you get really good at nonverbal communication. You could also just use an underwater slate and write everything down, but where’s the fun in that? Diving in the aquarium at Epcot. This is one of my favorite dives, because people can interact with you on the other side of the glass from an observation deck or a restaurant that looks out into the aquarium. Another benefit, and one of my favorite reasons to dive, is the serenity and lack of noise. When you’re underwater, all you typically hear is your breathing and your bubbles. Of course there’s a lot to be conscious of on a dive, like how much air you have left in your tank or whether you’re swimming in the right direction, but it’s mostly a time to discover fun and beautiful parts of the natural world and reflect. I’ve done some of my best meditation at the bottom of the ocean, and I’ll always say that to keep your head above water, sometimes you have to go underwater. And finally, diving is just cool. The Earth is about 70 percent water, so if you’re not exploring what’s below the surface, you’re not even getting a third of what the beautiful world has to offer. Seeing marine creatures up close and in their natural habitat is something not everyone has the opportunity to do. Being out in the open ocean, not being able to see shore and back-rolling off of a boat into the unknown may sound scary, but the rush of not knowing just adds to how awesome the entire experience is. You have no idea what’s under you — it could be a tiger shark or barracuda; it could be a goliath grouper that’s half the size of your boat or a green sea turtle. Or it could be nothing. The key is to just go with it. Most divers know the “vicious predators” of the ocean won’t be too interested in eating them, anyway.